1846 - moved to London and enrolled as a student at James Matthew Leigh's School of Art. 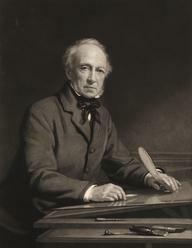 1855 - made his debut at the Royal Academy. 1857 - visited Spain on the advice of John Phillip. 1874 - visited Egypt and Syria 1875 - painted the Babylonian Marriage Market. 1876 - elected Associate Royal Academy 1881 - elected Royal Academician. 1882 - one of his paintings sold for 6,300 guineas, the highest price ever for a living artist. 1893 - his widow, Margaret Long, set up the Edwin Long Gallery at 25 Old Bond Street in a bid to revitalize intrest in his work.